Here you can plainly see the sharp cut away bow sections. Above the waterline the full bow flattens the chine that becomes greater as it moves aft. Note the nicely chamfered bulwark to reduce the visual height of the topsides. 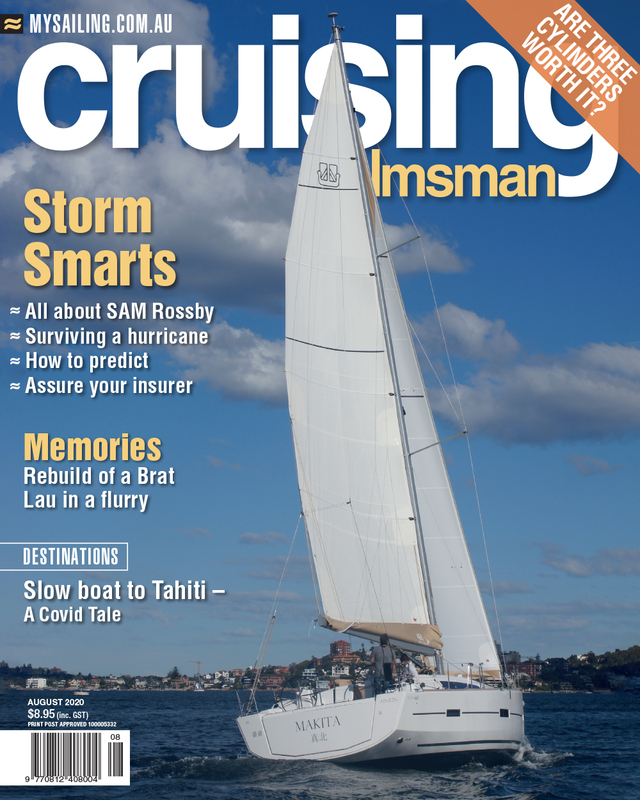 While it is understandable most readers would be jealous of yours truly having the opportunity to sail test a myriad of yachts for Cruising Helmsman. The reality, however, may differ somewhat from the perception. all the while taking even more notes and photos. I then transfer to a motorboat to take more photos of the yacht sailing. Then the last hour is usually sitting down below and finalising notes and making any more observations. It is a ‘get in and get out’ kind of operation, mindful of the yacht agency’s time and the yacht owner’s generosity. There are times, however, where the privilege lives up to its perception and last October was one such opportunity. French boatbuilder Jeanneau have immersed a fair amount of money into research and development in design and construction of its range of yachts. This has been noticeable with a marked difference in design over the past year with its latest range of Sun Odyssey’s. To promote these changes the company kindly provided me with the opportunity to test its latest Sun Odyssey, the 410, from the base in La Rochelle. Plus the added bonus of a tour of its manufacturing facility in Les Herbiers in Vendee, western France. Is it possible this generous offer would affect how I report on the sail test of the Sun Odyssey 410? Most probably; but to be fair, the yacht deserves the praise. This review may include added exuberance. One other bonus was to be able to take the 410 out for the test sail with the yacht’s designer, renowned Marc Lombard who lives in La Rochelle on France’s Bay of Biscay. For myself, being a non-engineer and ‘wanna-be’ yacht designer, it was an opportunity to discuss what he was hoping to achieve with the 410; plus what he sees as the trends in cruising yacht design. The chat was enlightening. For a long while now cruising yachts have been transferring the lessons learned in racing design and implementing it for a more gentler purpose. This essentially has equated to achieving a wide beam over as much of the hull as possible. While boat speed is definitely enhanced, the other benefits include a smoother sea action and the added bonus of interior hull volume. All positives in a cruising yacht. This wide beam is carried all through the aft sections of most production yachts today. But the latest lessons drawn from racing is to try and achieve maximum beam in the forward sections as well. This upgrade provides benefits when applied as a forward chine, seen in cruising designs nowadays. You may notice in the main photo on this page spread, how the underwater bow side section cuts away sharply; due to the increased beam in these sections this added volume lifts the bow out of the water, countering the broad sections aft. Check out the specifications in the image gallery at top. Thus the forward underwater profile can be limited to reduce slamming into waves, giving improved motion through a seaway. All very clever. The advantage is the light feel this gives the helm, with the boat almost steering itself both upwind and down. The yacht is stable and tacks easily, under motor it will turn in its own wake. Even when loaded for a long passage, the hull still sits high in the water, remaining light and responsive. Again, as with the aft beam sections, the added volume forward allows extra room down below in the master suite forward. According to Lombard, the boat is extremely large compared to its displacement, "with evolutions in design, the ratio between hull volume/submerged volume keeps growing, this allows us to reduce volume above the waterline, which reduces windage." Slowly the shift for Jeanneau is away from the slab-sided look of previous production yachts. The bouyancy comes from its hull, which is comparatively large to its displacement giving it a rather racy displacement to length ratio. Extra weight in the keel retains a nice ballast ratio, however, to ensure the hull is not so tippy. The next factor affected by this hull design is the sails. With such an easily-driven hull, there is not such a need for a large driving force. So the displacement to sail area ratio is high due to the light tonnage but sits just within the cruising band. Head downwind, set the Code 0 from the integrated bowsprit and you will wind away the sea miles with nary a strain. It is a high aspect ratio rig with the boom E measurement reaching only halfway down the cockpit length. Such an easily driven hull does not require much driving force so the jib is only 110 per cent on the J measurement. The total mast air draft is under 18 metres, which stands about a metre less than most other yachts this size; another added bonus for cruisers. In discussion with Lombard, he noted the formula generally recognised to provide a yacht’s theoretical hull speed (square root of waterline multiplied by 1.34) really needs to be overhauled. He makes a good argument when his computer-predicted polars show the SO410 will hit its hull speed of 7.31 knots at just 65 degrees off the wind in ten knots of breeze. We certainly did better than that in our test sail. Before we move on, one other general point he made regarding current design was the disappearance of the keel-stepped mast. Deck-stepping not only provides better control of the mast column with its associated rigging, but it also removes that terrible problem of the constant leaky mast boot. Progress indeed. On deck, maximum beam is attained at about the shrouds attachment point and carries all the way aft. Looking along the deck line to the bow you can easily see the bulbous forward sections discussed earlier. Lombard’s previous design for Jeanneau was the popular Sun Odyssey 349 a few years back, so he has not fiddled too much with the format here, why mess with a good thing? The introduction of the sloping side decks either side of the cockpit, leads to the inclusion of a low height bulwark. It also allows Lombard to make the steering stations on the twin wheels a little more ergonomic. You have various options when steering: you can sit or stand behind the wheel; or a little outboard while stretching your legs up the sloping sides; or you can sit traditionally, facing inboard with your forward hand on the wheel; this time, however, your legs are not bent over the cockpit coaming. The steering binnacles have an inset panel for the instruments easily visible from any steering position. The aft end of the cockpit table includes extra instruments as well, easily seen from either side. Most yachts, nowadays, are designed so the skipper can reach the sail-handling winches. The sloping side deck facilitates this with the skipper easily able to walk around his binnacle and stand alongside the winch without letting go of the wheel. The two standard halyard winches sit either side of the companionway. The cockpit is huge, with plenty of space to walk either side of the centre table. A space within the table is designed to fit a portable refrigerator that can be taken down below or onshore. The change to cathedral rigging means access to the bow is no problem. Once you reach the foredeck those wide above-water sections provide a spacious lounging area with a massive sail stowage and anchor locker. The integrated bowsprit assists in making this deck working space bigger, by moving the twin foresail roller furlers outboard; it also takes the anchor out safely away from the stem. On the cabin top the boom gooseneck is quite low on the mast. Once again, this gives designer Lombard some added benefits. Firstly it helps to increase mainsail area without raising the mast height; plus it makes handling the mainsail that much easier, especially when dropping it into the boom bag and zipping the cover. This advantage has been utilised by catamaran designers for many years. I had been excited to be getting the opportunity to take a Marc Lombard design out for a sail on the infamous Bay of Biscay. The last time I had sailed these waters I had been rounded up and flattened by a huge rogue wave in 30 knots, while steering an 80 foot maxi IOR racing yacht. Biscay and I had some unfinished business. It turns out we are now the best of friends. The weather was a balmy 10kn to 15kn on a flat sea in brilliant sunshine. The waters were full of many mid-week yachties taking advantage of some out of the ordinary weather. It was still enough to put the SO410 through its paces though, albeit at a more controlled pace compared to my last visit. To be blunt, the SO410 sails just like it is designed: steady, fast, light and easy. We headed out from La Rochelle, past large fleets of youth sail training schools, unfurled the sails and just sat back in the cockpit and chilled while the yacht heeled slightly at the just-cracked sheet angle and stayed on course. I barely had to touch the helm. The self-aligning rudders with self-aligning bearings give a light feel on the helm, but are nicely responsive to any adjustment. This is long passage-making sailing done with ease. It was the first long sail Lombard had done on his creation and he was enjoying the success of his design ideas immensely. It was a delight to join in his obvious joy. While it will point close to the 30° wind angle, it really is the 35° to 40° band that you get the best velocity made good upwind. For cruising, it is definitely the 50° to 80° cracked sheets domain where she really likes to fly in all wind strengths. As mentioned before, get the wind aft of the beam and you are looking for 110° to 130° to get the best mileage, especially with the Code 0. While the speed is useful, however, it is the ease with which it performs that truly sells this yacht. It must be an incredible feeling to design a yacht with all your best hopes and latest ideas and then take it sailing to find out it performs as well as desired and maybe even better. The revitalised thinking on hull design has rejuvenated interior design as well. There are some interesting additions made to the cabin of the SO410. There are four layout options with either two or three cabins. The difference being whether you decide to add another head and shower in the main cabin. If you do decide to make it a two head arrangement then the main cabin berth is angled along the starboard side of the hull. This is the configuration we sailed with: three cabins/two heads. All berths take standard double bed sheeting over two single mattresses to allow lee cloths to be inserted if desired. Underneath are deep pull-out drawers for bulky storage. Except on the port aft berth which includes the battery station. The main berth is interesting being angled along the starboard hull to squeeze the head cabin in on the port side. It is different but not upsetting, the only noticeable change is the lack of a side step alongside the bed to make better access for the two sleepers. Forward of this berth is an easy access to the windlass electrical panel. This forward head is tight and you have to step into the the toilet compartment to be able to close the door and get into the shower compartment. Once in and the doors closed, you do have plenty of elbow room and a large overhead hatch reduces any feeling of claustrophobia. Enough storage is provided along the hull and under the sink. The forward cabin door is offset to starboard to accommodate the head cabin. This means in the main saloon the port side has plenty of space for another change in standard saloon design. A day lounge comes off the forward bulkhead, perfect for reading a book or snoozing on the off watch leaning against the bulkhead. Pull out the underneath drawer and it is actually an extender for the day lounge turning it into a full berth or seating for the extendable saloon table. Outboard of this novel lounge is the G-shape galley. It is a suitable tight fit with a two-burner gimballed stove and cooktop and plenty of bench space with refrigeration underneath. You do a bit more ferreting around and you find any spare space has been cleverly press-ganged into providing another cupboard or drawer, not a spare piece of space is wasted. The fiddlework is deep and strong, especially around the cabinet at the end of the galley, which would become the major grabbing point for anyone standing up down below. The saloon to starboard has the expandable table that will drop down to provide another double berth if desired. That makes potential sleeping for nine. Nice to see Jeanneau are retaining the desire to have a set-apart navigator’s table, with its curved seat and lots of storage pockets. Here there are plugs to use the shore power plus two USB ports. On the other side of the three companionway steps is the starboard head cabin. Once again it is suitable in size for a 41 footer, there is no overhead hatch but one on the cabin side. Overall the interior is light and visually open but cleverly uses spaces for separate living without getting in anyone else’s way. Cranking up the 29 kilowatt Yanmar and the hull glides along to finish our day. La Rochelle marina is quite large but the retractable bow thruster makes manoeuvring easy when combined with the twin rudders. I made a botch of my reversing, the pressure of being under the watchful eye of its designer, but thankfully Marc and the Jeanneau representative Matthieu saved my bacon with simple control of the thruster. This was a delightful day and I can see the Sun Odyssey 410 providing many such days to its owners around the world.